It's no secret that lots of YouTubers have been releasing books recently, and admittedly I haven't picked up any other for more than a quick flick through in a shop, I couldn't miss this one. Louise was the first YouTuber I really watched and the first blog I ever read. Both of these things I discovered when I was locking myself away because I didn't want to be seen by anyone. I thought if I watched and read peoples online content I could feel like my life didn't really exist. I must admit that for some videos I watched this was true, but Louise's videos gave me confidence that I could be my own person and I shouldn't feel ashamed at all. The blog posts were like talking to a friend over coffee and the vlogs made me want to recover to see what I could achieve, so missing this book really wasn't an option for me. And needless to say I loved it. I love the layout of the pages, almost like a scrapbook feel with doodles and chunks of text on a page rather than simply a 'traditional' chapter book. Life With A Sprinkle of Glitter has been a book that can be read cover to cover, or dipped in and out of, and I completely agree with that. Personally I read it cover to cover, but I know that when I need a tip or a little pick me up I can just turn to certain sections of the book. Life With A Sprinkle Of Glitter is filled with so much advice, and funny stories to go alongside, that there's going to be something that everyone can take away from it. 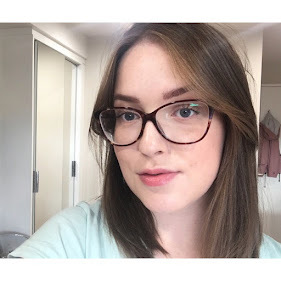 Whether it be about crafts, beauty, self confidence or dating I think there is something that everyone could benefit from, especially if you enjoy reading Louise's blog as the writing style is exactly the same - chatty and friendly, but with loads of advice. My favourite section was on body confidence, to read her experiences and then tips and tricks that she'd learnt along the way have really inspired me to stop putting myself down so much. I know that Life With A Sprinkle Of Glitter will live on my shelves for many more years, and will come in handy at lots of different stages of my life, or when I simply need a little reminder of the importance of kindness. This sounds really cheesy, but for a long time Louise has been my all time favourite blogger and YouTuber, and I'm just so pleased for her that she's released such an amazing book unlike any other I've read. I 100% recommend it. Are you going to be reading Life With A Sprinkle Of Glitter?